Texas Senator Ted Cruz was booed as he failed to endorse Donald Trump as the US Republican nominee, during a speech at the party convention in Cleveland. Mr Cruz only went as far as congratulating the man who had been his bitter rival in the primary contests. Angry chants of "We want Trump!" and "Endorse Trump!" grew louder as the senator came to the end of his speech. 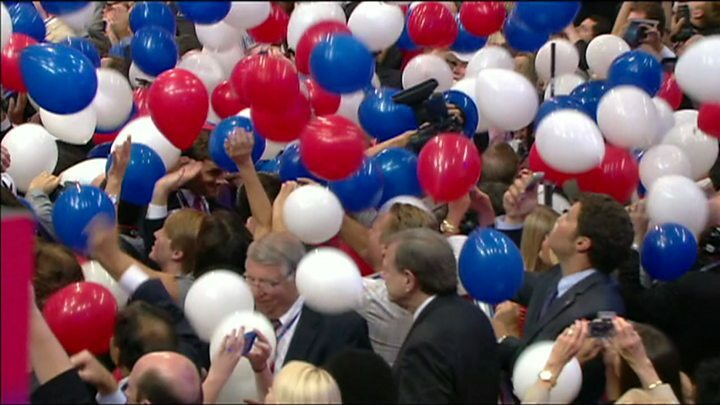 Indiana Governor Mike Pence then took centre stage to give his vice-presidential acceptance speech. Mr Pence praised Mr Trump's record as a businessman and said the country had "but one choice" in November. "It's change versus the status quo, and when Donald Trump is president, the change will be huge," he said. 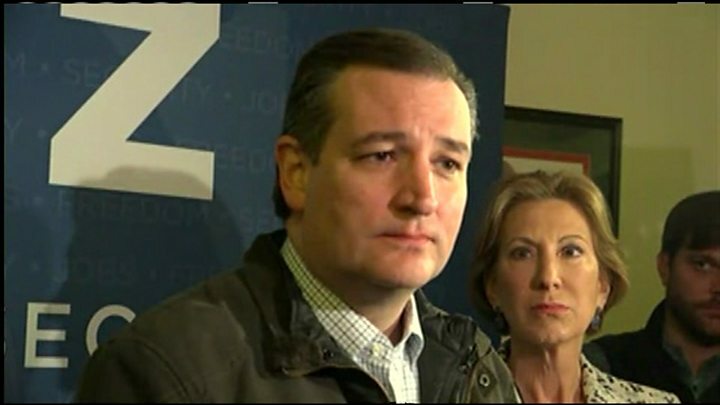 But Mr Cruz is likely to steal the headlines after stoking the rage of the convention, to such an extent that his wife Heidi had to be escorted from the floor. A former colleague of Ted Cruz's once told me that the one unforgivable sin in the Texas senator's mind is to insult or demean Rafael Cruz, Ted Cruz's father. Donald Trump did that toward the end of the presidential primary campaign, questioning whether the elder Cruz had ties to John Kennedy's assassination. And on Wednesday night, before a national audience on the Republican Party's biggest stage, the Texas senator got his revenge. As Mr Cruz left the stage after his non-endorsement speech, showered in boos, he gave a brief thumbs-up, apparently satisfied that the deed was done. And what he did was turn the Republican convention on its head once again. Now, everyone will be talking about his speech - overshadowing what should have been vice-presidential nominee Mike Pence's coming-out party. Mr Pence is the stable, trusted conservative politician who was supposed to rally unsure Republicans behind their new standard-bearer. Instead, Mr Cruz revealed a party still sharply divided. While those inside the arena seemed united in booing the senator, some conservatives outside the Trump-friendly confines praised his actions. Politically, Mr Cruz has made a risky move, however. He has staked his future presidential hopes on the chance that Republicans will view him as a principled conservative and not a right-wing Judas. Given that Donald Trump received more than 12 million votes in 2016, that is a lot of support that he may have just permanently angered. But an insult was answered. "Lyin' Ted" had his moment of vengeance. In his speech, Mr Cruz told supporters to "vote [with] their conscience" and not to stay at home for the general election. He finished second to Mr Trump in the delegate count during a campaign that featured personal attacks by the New York businessman on Mr Cruz's wife and father. The boos that drowned him out stopped when Mr Trump entered the convention hall before Mr Cruz had finished speaking. Mr Trump later said he knew Mr Cruz would not endorse him but had let him speak anyway. New Jersey Governor Chris Christie said his actions were "awful" and New York Congressman Peter King called the speech "disgraceful". Image caption Mr Pence called Mrs Clinton "secretary of the status quo"
The drama came at the end of the day when the Republicans tried to finally put the plagiarism scandal behind them. Melania Trump faced accusations of copying after it was discovered that lines in her remarks matched almost word for word a convention speech delivered by Michelle Obama in 2008. After initial denials from the campaign, Meredith McIver, a Trump Organisation employee, admitted her role in writing the speech and apologised for the "chaos I have caused". Thursday night is the main event of the four-day event - Mr Trump's acceptance speech. 1. What is the point? At a convention, each party formally nominates its candidates for president and vice-president, and the party unveils its party platform, or manifesto. 3. Who isn't going? Some senior figures who dislike Donald Trump have stayed away, including two ex-presidents named Bush, former nominee Mitt Romney and Ohio Governor John Kasich.